Japanese izakaya dishing out copious amounts of rolls, small plates, teriyaki and saké; expect a hard-to-beat happy hour, too. : Kevin Aoki branched out after working for 20 years with his dad (founder of the Benihana chain) in the 90s, opening a hip Japanese izakaya on Lincoln Road, followed by a Brickell outpost. Seafood is flown in fresh daily for menu items like yellowtail tiradito (thin slices in yuzu-soy “seared” in hot olive oil) and octopus carpaccio with kimchi. Besides sushi accented with Hawaiian sea salt, shiso leaves and kaiware (daikon) sprouts, there’s tempura and teriyaki, and dishes like saké-steamed mussels and eggplant miso. Specialty rolls include the bamboo with avocado, asparagus and cucumber in soy paper with creamy ginger dressing, and the dancing eel roll with sweet omelet. 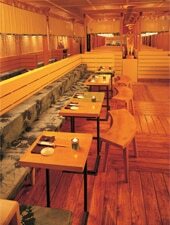 There are special lunch and dinner happy hour menus, and the saké list has more than 60 choices served hot or cold. Also located at 900 S. Miami Ave., Ste. 133, 305-373-4633.